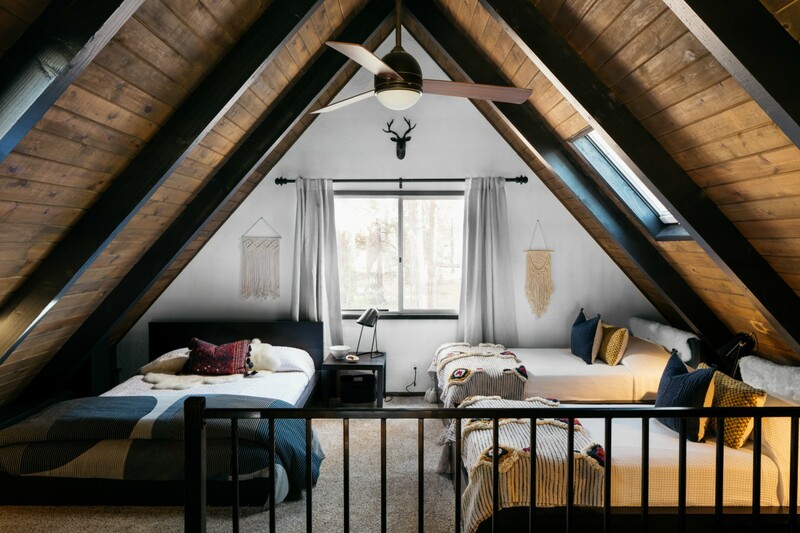 Proving that a little sweat and ingenuity makes for great design, this formerly outdated A-frame cabin in Big Bear, California underwent a major transformation at the hands of its owner. Courtney Poulos loved her 880-square-foot cabin – but not its 1970s look – so she gave the space a modern makeover the preserves its rustic charm. 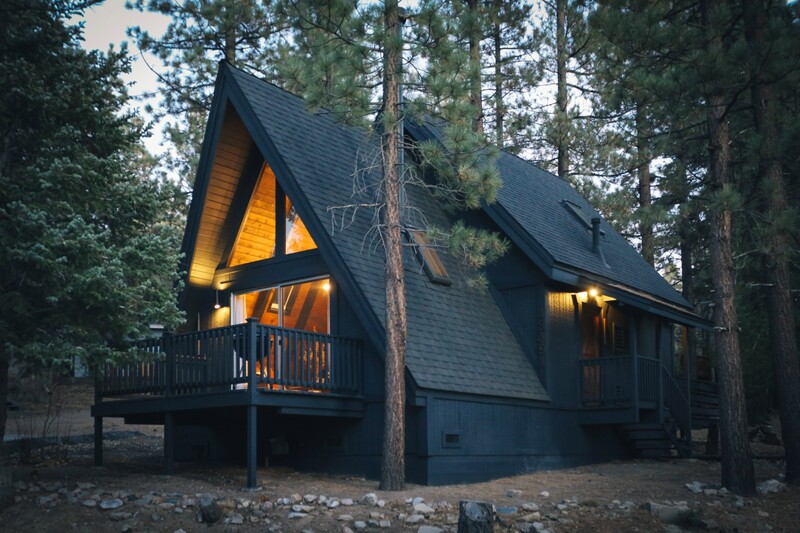 Reforming the 1973 wood cabin would not be an easy task, principally because of budget and time restraints. Working with $40,000 and five weeks time, the rehabilitation of the space was even more complicated thanks to the fact that all of the materials had to be hauled up the mountainside. 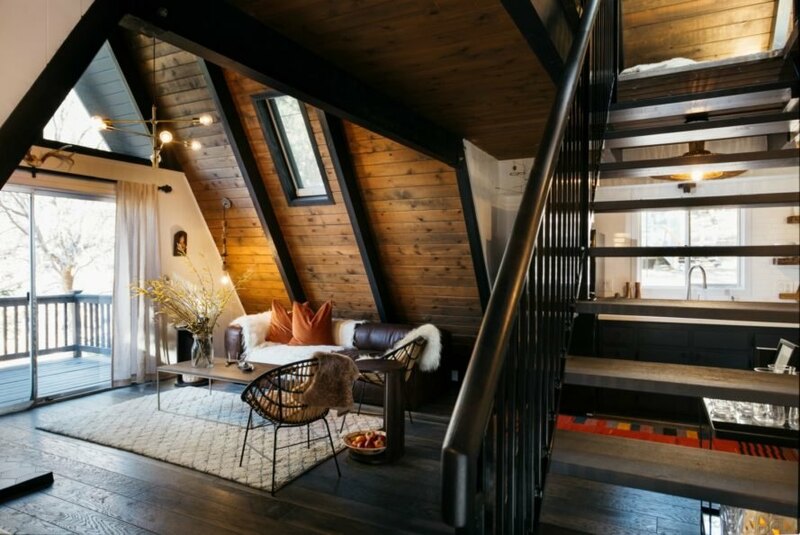 With a little interior design help from Nicole Palczynski of Vein Design, Poulos began the project with a few key focus points to guide the design theme, “We wanted to create a handsome space full of butterscotch and whiskey undertones, dark woods, and light accents,” she remembers. 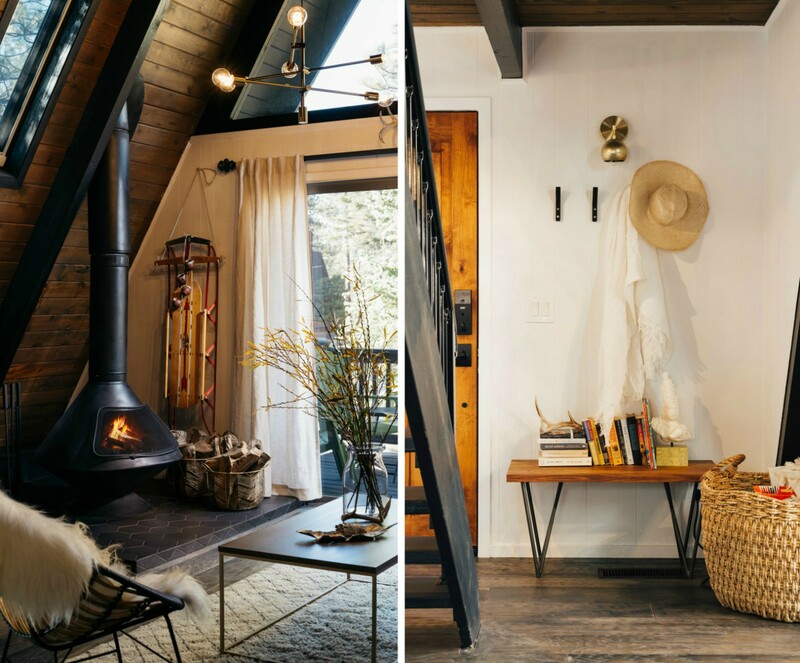 Starting in the interior, the ceiling’s high wood beams were painted a dark ebony that made the other features such as the light wooden paneling on the walls and the hearth’s brick base stand out. The kitchen also has a new look thanks adding a fresh coat of paint to the existing solid wood cabinets. 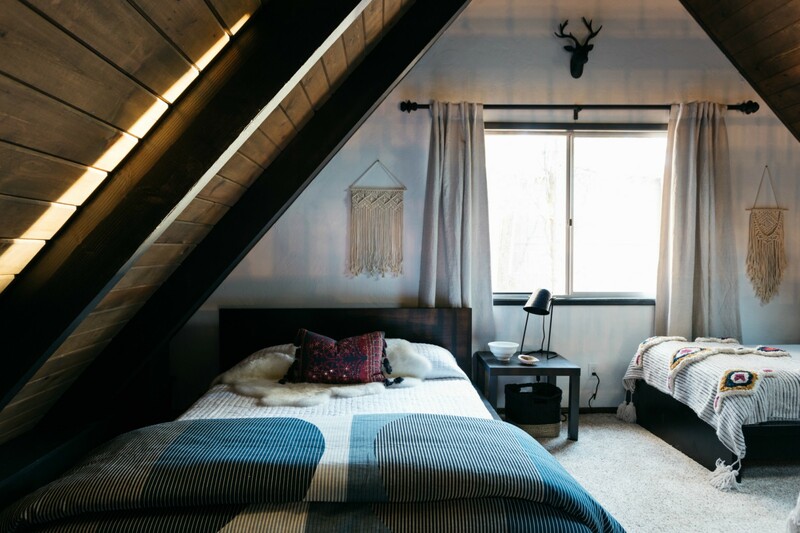 A fun, bohemian theme was used to update the bedrooms using patterned textiles and saturated colors. The renovation also focused on bringing as much natural light to the interior as possible. 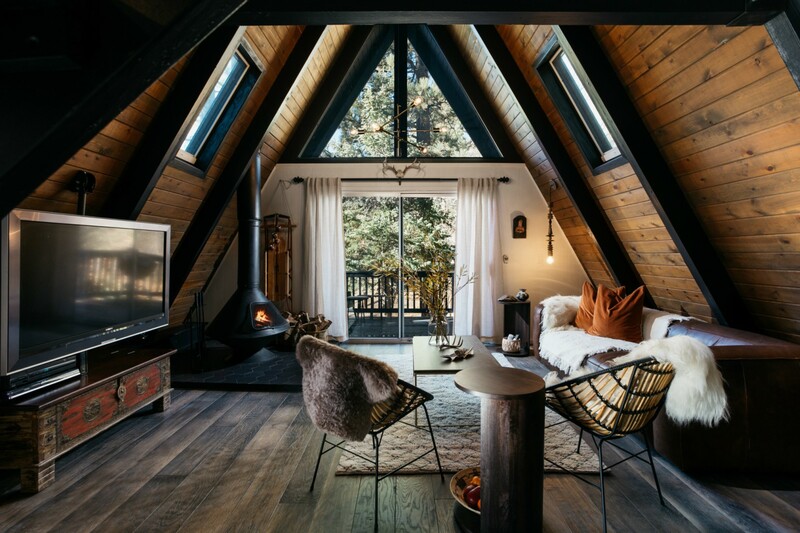 Proving that a little sweat and ingenuity makes for great design, this outdated A-frame cabin in Big Bear, California has just undergone a major transformation at the hands of its owner. 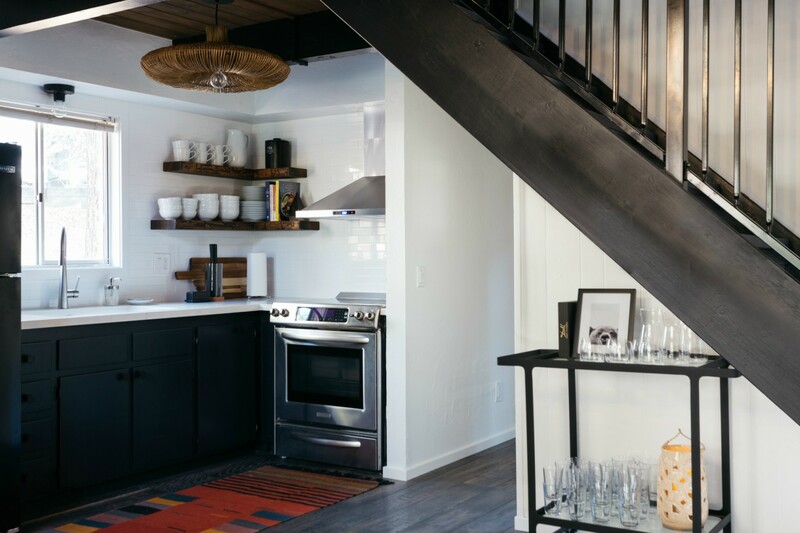 Courtney Poulos loved her 880-square-foot cabin, but its outdated look inspired her to give it a strategic makeover that would add a more modern feel to the space without losing the cabin's rustic charm. 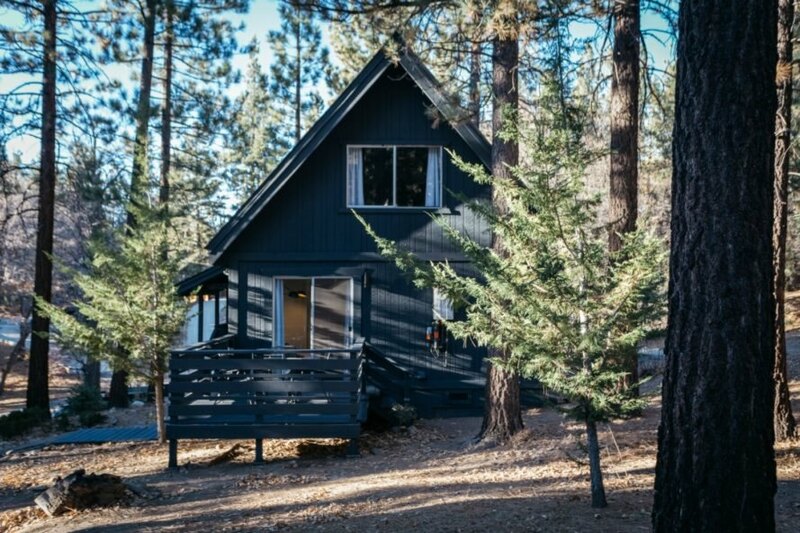 Reforming the 1973 wood cabin would not be an easy task. The makeover process had quite a few budget and time restraints. The existing kitchen cabinets were painted to save money. Working with $40,000 and five weeks time, the rehabilitation of the space was even more complicated thanks to the fact that all of the materials had to be hauled up the mountainside. The kitchen also has a new look thanks adding a fresh coat of paint to the existing solid wood cabinets. 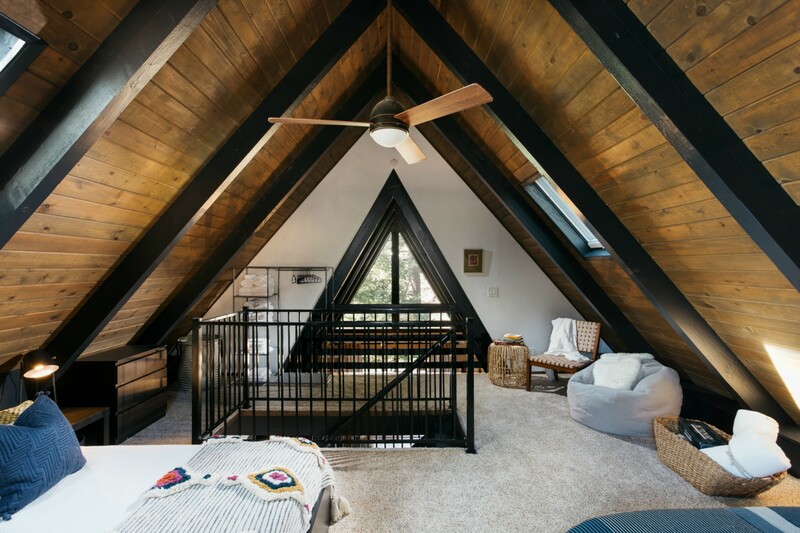 Starting in the interior, the ceiling's high wood beams were painted a dark ebony that made the other features such as the light wooden paneling on the walls and the hearth's brick base stand out. The A frame space was enhanced by the newly painted beams. The renovation also focused on bringing as much natural light to the interior as possible. The home was madeover thanks to some new paint and furnishings. With a little interior design help from Nicole Palczynski of Vein Design, Poulos began the project with a few key focus points to guide the design theme. A fun, bohemian theme was used to update the bedrooms using patterned textiles and saturated colors. 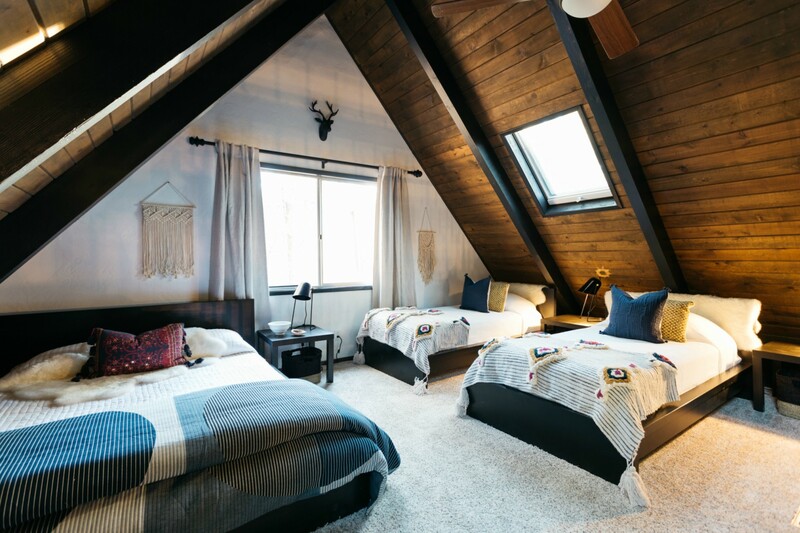 The bedrooms were decorated with a bohemian feel. After the project was finished, Poulos was amazed at how much she could do on a limited budget.